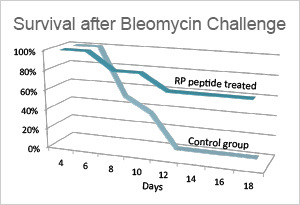 Peptide activity is involved not only in the human body's immediate response to infection, wounds, and burns, but in resolving these situations and returning the system to biochemical balance. 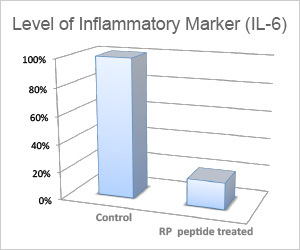 Certain Host Defense Peptides and their fragments have strong anti-inflammatory properties. These fragments restore the balance of immune cells which cause inflammation around a lesion, after microbial invaders have been dealt with. Riptide has characterized the anti-inflammatory sequences and enhanced their activity in a set of engineered peptide therapeutics. In a variety of animal models, the effect is to dramatically lower measures of inflammatory "cytokine" signaling and to improve survival. Animal models of inflammatory disease (colitis, multiple sclerosis, pulmonary fibrosis) are consistently improved with daily subcutaneous administration of small quantities of Riptide drug candidates (see figures). Riptide anticipates early application of its therapeutics to several diseases where topical or subcutaneous application is feasible, including scleroderma. Preclinical studies on animal models are well underway and highly promising.